CALGARY, ALBERTA - (January 31, 2019) - Antioquia Gold Inc. ("Antioquia Gold" or the "Company") (TSX VENTURE: AGD) (OTCQX: AGDXF) is pleased to announce the start of testing of its treatment plant located in Cisneros, Colombia. The equipment and processes put into operation were: primary crushing (Metso C80) secondary crushing (Metso Nordberg HP200), grinding mill (Denver 8'x10'), gravity concentration (Falcon SB1350), flotation rougher and scavenger (8 cells Outotec), flotation cleaner and re-cleaner (9 Denver cells) and concentrate filtration (Cidelco filter). The treatment rate for the initial tests started at 100 TPD, and then quickly ramped up to 230 TPD, below the plant capacity of 500 TPD. The Company will continue to ramp up the treatment rate in the following weeks to reach the maximum capacity level. The Company is producing two gold and silver products: gravity concentrates and flotation concentrates. Antioquia Gold thanks all of the team that participated and contributed to achieve this important milestone in the development and start-up of its Cisneros development, which will generate benefits to communities in its area of influence and in Colombia in general. Roger Moss, Ph.D., P.Geo., Consultant to Antioquia Gold, is the qualified person as defined by National Instrument 43-101 and has reviewed and approved the technical information provided in this news release. Forward-looking statements are made based upon certain assumptions by the Company and other important factors that, if untrue, could cause the actual results, performances or achievements of Antioquia to be materially different from future results, performances or achievements expressed or implied by such statements. Such statements and information are based on numerous assumptions regarding present and future business prospects and strategies and the environment in which Antioquia will operate in the future, including the accuracy of any resource estimations, the price of gold, anticipated costs and Antioquia's ability to achieve its goals, anticipated financial performance, regulatory developments, development plans, exploration, development and mining activities and commitments. Although management considers its assumptions on such matters to be reasonable based on information currently available to it, they may prove to be incorrect. Additional risks are described in Antioquia's most recently filed Annual Information Form, annual and interim MD&A and other disclosure documents available under the Company's profile at: www.sedar.com. Readers should also be cautioned that the Company's decision to move forward with the construction and production of the Cisnero Mine is not based on the results of any pre-feasibility study or feasibility study of mineral resources demonstrating economic or technical viability. Readers are referred to the Cisneros Report for details on independently verified mineral resources on the Cisneros Project. Since 2013, the Company has undertaken exploration and development activities; and after taking into consideration various factors, including but not limited to: the exploration and development results to date, technical information developed internally, the availability of funding, the low starting costs as estimated internally by the Company's management, the Company is of the view that the establishment of mineral reserves, the commissioning of a pre-feasibility study or feasibility study at this stage is not necessary, and that the most responsible utilization of the Company's resources is to proceed with the development and construction of the mine. Readers are cautioned that due to the lack of pre-feasibility study or feasibility study, there is increased uncertainty and higher risk of economic and technical failure associated with the Company's decision. In particular, there is additional risk that mineral grades will be lower than expected, the risk that construction or ongoing mining operations will be more difficult or more expensive than management expected. Production and economic variables may vary considerably, due to the absence of a detailed economic and technical analysis in accordance with NI 43-101. Project failure may materially adversely impact the Company's future profitability, its ability to repay existing loans, and its overall ability to continue as a going concern. CALGARY, ALBERTA - (December 17, 2018) - Antioquia Gold Inc. ("Antioquia Gold" or the "Corporation") (TSX VENTURE: AGD) (OTCQX: AGDXF) is pleased to provide an update on the status of construction work at the Cisneros Project. Preparation and development continue in the deepening of the main ramp, which will extend to level 1060. To date there are 7,053 meters of progress, of which 2,350 meters have been developed on mineralized structures. A new ventilation raise has been connected to the surface, which will allow optimum ventilation conditions inside the mine in the Nus zone. A total of 5,300 tons have been mined with the cut and fill method during the mining test phase on level 1160 along the Guaico, FW3 and FW5 veins. The first block of 24,000 tons for bench & fill mining of the Nus vein with long drills has been delineated and supported with cable bolts. Banks 15 meters high and wide will be mined. So far, 2,200 tons have been mined in preparation. 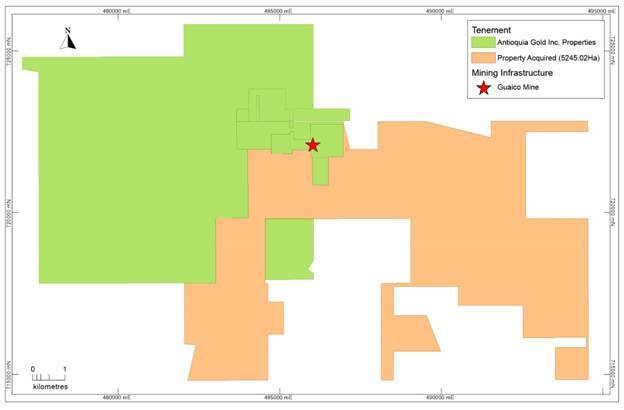 Continued progress has been made with the recognition of mineralized structures on level 1460. So far, 4,150 meters have been advanced, of which 1,430 meters have been on the mineralized structures El Bolo, GYBX, GYBD4, GYBC, GYB2, GYB4 and GYBD3. This has defined 400 linear meters of economically exploitable stopes on the structures. The preparation and development tasks are focused on deepening the ramp that currently reaches the 1420 level and the climb ramp at level 1510. The mineralized material extracted during the development work is being stockpiled with 4,500 tons accumulated to date. Concrete installations were completed for the following areas: crushing, grinding, fine hopper, gravity concentrator, filtering, flotation, reagents, tailings pumping, and air and water services. The metallic structures of the main buildings were completed, and progress made in the assembly of platforms in the crushing area which will be installed in the third week of December 2018. The mechanical assembly of the crushing, grinding, gravity, flotation, reagents, filtering, water and air service equipment is complete and ready to start pre-commissioning. Progress is currently being made in the assembly of conveyor belts and chutes in the crushing and grinding areas. Assembly work for the electric substation and medium voltage connections for electrical rooms has been completed. Progress was made in the installation of cable tray, support and wiring in the crushing, grinding and gravity areas, with expected completion in the third week of December 2018. Construction of the tailings dam was completed together with the industrial wastewater treatment plant (PTARI) and preparations to start operational tests were made. Construction of the foundations and the assembly of the metal structure for the pipeline continues. The pipeline consists of two lines of pipe 9.7km in length with 37 overpasses. The positioning of the pipeline and the manual filling of the trench has been completed and progress made in the installation of accessories for venting and purging valves. The pre-commissioning of the process plant will start the third week of December, with the flotation areas (flotation cells, pulp pumps, hydrocyclone), air service (blower, filter and air system) and electrical substation (electrical rooms) and will end the last week of December with the areas of crushing, grinding and gravity circuit. The commissioning of the process plant will start the first week of January 2019 at 200 tonnes per day (TPD). The treatment rate will be raised progressively until the maximum installed capacity of 500 TPD is reached at the end of Q1 2019. The contingency dam located near the Guayabito plant will be temporarily used for the start of commissioning while construction of the pipeline is completed, which is expected in Q1 2019. Readers should be cautioned that the Corporation's decision to move forward with the construction and production of the Cisneros Mine is not based on the results of any pre-feasibility study or feasibility study of mineral resources demonstrating economic or technical viability. Readers are referred to the Cisneros Report for details on independently verified mineral resources on the Cisneros Project. Since 2013, the Corporation has undertaken exploration and development activities; and after taking into consideration various factors, including but not limited to: the exploration and development results to date, technical information developed internally, the availability of funding, the low starting costs as estimated internally by the Corporation's management, the Corporation is of the view that the establishment of mineral reserves, the commissioning of a pre-feasibility study or feasibility study at this stage is not necessary, and that the most responsible utilization of the Corporation's resources is to proceed with the development and construction of the mine. Readers are cautioned that due to the lack of pre-feasibility study or feasibility study, there is increased uncertainty and higher risk of economic and technical failure associated with the Corporation's decision. In particular, there is additional risk that mineral grades will be lower than expected, the risk that construction or ongoing mining operations will be more difficult or more expensive than management expected. Production and economic variables may vary considerably, due to the absence of a detailed economic and technical analysis in accordance with NI 43-101. Project failure may materially adversely impact the Corporation's future profitability, its ability to repay existing loans, and its overall ability to continue as a going concern. Readers should also be cautioned that the Corporation's decision to move forward with the construction and production of the Cisneros Mine is not based on the results of any pre-feasibility study or feasibility study of mineral resources demonstrating economic or technical viability. Readers are referred to the Cisneros Report for details on independently verified mineral resources on the Cisneros Project. Since 2013, the Corporation has undertaken exploration and development activities; and after taking into consideration various factors, including but not limited to: the exploration and development results to date, technical information developed internally, the availability of funding, the low starting costs as estimated internally by the Corporation's management, the Corporation is of the view that the establishment of mineral reserves, the commissioning of a pre-feasibility study or feasibility study at this stage is not necessary, and that the most responsible utilization of the Corporation's resources is to proceed with the development and construction of the mine. Readers are cautioned that due to the lack of pre-feasibility study or feasibility study, there is increased uncertainty and higher risk of economic and technical failure associated with the Corporation's decision. In particular, there is additional risk that mineral grades will be lower than expected, the risk that construction or ongoing mining operations will be more difficult or more expensive than management expected. Production and economic variables may vary considerably, due to the absence of a detailed economic and technical analysis in accordance with NI 43-101. Project failure may materially adversely impact the Corporation's future profitability, its ability to repay existing loans, and its overall ability to continue as a going concern. CALGARY, ALBERTA - (September 19, 2018) - Antioquia Gold Inc. ("Antioquia Gold" or the "Corporation") (TSX VENTURE:AGD)(OTCQX:AGDXF) is pleased to provide an update on the status of construction work and development at the Cisneros Project. Preparation and development work continues with the extension of the main ramp down to level 1060. To date 6,650 meters are complete, of which 2,350 meters were developed on mineralized structures. Cut and Fill mining tests started at level 1160 in August, with mining of the mineralized zone at a width of 1.2 meters to minimize dilution and with subsequent expansion to 1.8 meters for the transit of the equipment (Jumbo Muki and Scoop Aramine L130D). This technique is known as “circado” and is being applied in the narrow veins such as Guaico, FW3 and FW5. Bench and Fill mining is planned for the Nus shear zone A geomechanical study was carried out by DCR Ingenieros SR Ltda, who validated the opportunity to increase the bank height to 20 meters, allowing for a reduction in the cost of mining and an increase in productivity. The newly acquired mineral sorting equipment will be installed inside the Guaico mine in order to maximize the benefits of pre-concentration. Currently, the excavation of the two chambers required to host the ore sorting area is under construction. Progress includes the recognition of mineralized structures at level 1460, and development of 3,350 meters, of which 1,110 meters are on the mineralized structures El Bolo, GYBX, GYBD4, GYBC, and GYB2. Development is focused on deepening the ramp and the positive operating ramp of level 1460. A ventilation raise 250 meters in length has been connected to the surface, and the mine now has an open ventilation circuit and an alternative exit in case of emergencies. In addition, this work confirmed the continuity of the structural system south of previously identified zones. The company made the final payment to Gramalote as consideration for the recently acquired Guadualejo mining property. (see news release August 22, 2018). Currently, exploration work within the 5,245 ha area is being planned and will include soil sampling, geophysics and geological mapping to identify potential mineralization near the Guaico mining unit. Construction of columns (“pilotes”) for foundations of all the terraces are complete. The concrete works of the filtration, flotation, gravimetric, air and water service, grinding, and electric substation areas are complete, and progress is made in the concrete works of the tailings, reagents and crushing areas. The 8'x10' Denver ball mill assembly has been completed. Installation of hydrocyclone, high frequency saw, press filter, equipment for air service, flotation cells and pulp pumps is complete. Water tanks, gravimetry and bridge cranes are being assembled. The assembly of the metallic structure of the buildings in the filtering, grinding and air service areas are complete, and the assembly of roofs and of the metallic structure of the flotation area are near completion. The main connection works and the internal electrical network have been completed. Work is being carried out on the installation of cable tray and wiring from the electric substation to the plant, as well as the support for the air building. The extension and welding of the pipeline, consisting of two pipelines 9.7 km in length, was completed throughout the project. Work on the construction of foundations for overpasses and installation of accessories and valves for venting and purging is being carried out. The detailed engineering for the ore sorting plant is in process. Readers should also be cautioned that the Corporation's decision to move forward with the construction and production of the Cisnero Mine is not based on the results of any pre-feasibility study or feasibility study of mineral resources demonstrating economic or technical viability. Readers are referred to the Cisneros Report for details on independently verified mineral resources on the Cisneros Project. Since 2013, the Corporation has undertaken exploration and development activities; and after taking into consideration various factors, including but not limited to: the exploration and development results to date, technical information developed internally, the availability of funding, the low starting costs as estimated internally by the Corporation's management, the Corporation is of the view that the establishment of mineral reserves, the commissioning of a pre-feasibility study or feasibility study at this stage is not necessary, and that the most responsible utilization of the Corporation's resources is to proceed with the development and construction of the mine. Readers are cautioned that due to the lack of pre-feasibility study or feasibility study, there is increased uncertainty and higher risk of economic and technical failure associated with the Corporation's decision. In particular, there is additional risk that mineral grades will be lower than expected, the risk that construction or ongoing mining operations will be more difficult or more expensive than management expected. Production and economic variables may vary considerably, due to the absence of a detailed economic and technical analysis in accordance with NI 43-101. Project failure may materially adversely impact the Corporation's future profitability, its ability to repay existing loans, and its overall ability to continue as a going concern. CALGARY, ALBERTA - (August 22, 2018) - Antioquia Gold Inc. ("Antioquia Gold" or the "Corporation") (TSX VENTURE: AGD) (OTCQX: AGDXF) is pleased to announce that it has reached a binding agreement with Gramalote Colombia Limited ("GCL") whereby the Corporation will acquire from GCL 5,245 hectares comprising the "Guadualejo" property for the sum of US$ 685,000 to be paid from cash on hand. The agreement was signed on August 15th, 2018 and Antioquia Gold acquired one hundred percent (100%) of the rights to the Mining Concession Contract number 6195, as well as the obligations arising thereof. The change of ownership of the Concession must still be registered with the government authorities. The area is located immediately adjacent to the south and east of the mining concessions where the Guaico Mine of the Cisneros Project is being developed, and has the potential to provide continuity of the main mineralized structures of Nus and the tension veins of the Guaico system. See Figure 1 below. Roger Moss, Ph.D., P.Geo, the Company's Qualified Person, has verified the data contained in this news release. The verification was done by visual examination of the Company's database and comparison with the numbers and assays presented herein. No inaccuracies were found during the verification procedure. Upon the completion of initial exploration activities, anomalous values were identified in the soils and rocks. Follow up diamond drilling confirmed the existence of mineralized structures with prospective grade. Highlights of these results are presented in Tables 1, 2 and 3 below. Note: All rock samples are grab samples. Grab samples are selected samples and are not representative of the mineralization hosted on the property. *Intersections are downhole lengths and not true width. According to reports by GCL, the mineralized structures found resemble other mineralized structures currently under development within the operations of the Cisneros project. The structures consist of veins, veinlet and shear zones, filled with quartz, sulfides, carbonates, sericite, chlorite, among others, with variable thicknesses ranging from a few centimeters to 2 meters. With this acquisition, Antioquia Gold consolidates the properties adjacent to its Cisneros project and extends the areas with potential mineral resources. Future detailed exploration will be carried out in the acquired area in order to seek to expand the inventory of resources and extend the life of the operations carried out at the Cisneros project. During the drilling campaign samples were collected, logged (geological & geotechnical), cut and sampled at GCL's drilling camp in the project area. All quality control ("QC") samples were introduced before shipment to ALS Minerals' sample preparation facilities in Medellin, Colombia. The prepared samples were then shipped to ALS Minerals' analytical facilities in Lima, Peru for analyses. Gold was fire-assayed using a 50 gram aliquot sample and Atomic Absorption finish. Multi-element analysis is achieved by Four Acid Digestion and an Induced Coupled Plasma- Emission Spectroscopy finish. GCL's QA/QC program included the regular insertion of blanks, multiple certified assay standards and duplicate samples into the sample shipments. These QC samples were inserted in every assay batch with each batch comprising 12% of such samples. Monitoring of these QC samples is a critical part of GCL's QA/QC protocols that involve the re-analysis of a minimum of 10 samples bounding any failed control sample. A third party check laboratory receives 5% of all samples to verify the original assays. Readers should also be cautioned that the Corporation's decision to move forward with the construction and production of the Cisneros Mine is not based on the results of any pre-feasibility study or feasibility study of mineral resources demonstrating economic or technical viability. Readers are referred to the Cisneros Report (News Release November 20, 2018) for details on independently verified mineral resources on the Cisneros Project. Since 2013, the Corporation has undertaken exploration and development activities; and after taking into consideration various factors, including but not limited to: the exploration and development results to date, technical information developed internally, the availability of funding, the low starting costs as estimated internally by the Corporation's management, the Corporation is of the view that the establishment of mineral reserves, the commissioning of a pre-feasibility study or feasibility study at this stage is not necessary, and that the most responsible utilization of the Corporation's resources is to proceed with the development and construction of the mine. Readers are cautioned that due to the lack of a pre-feasibility study or feasibility study, there is increased uncertainty and higher risk of economic and technical failure associated with the Corporation's decision. In particular, there is additional risk that mineral grades will be lower than expected, the risk that construction or ongoing mining operations will be more difficult or more expensive than management expected. Production and economic variables may vary considerably, due to the absence of a detailed economic and technical analysis in accordance with NI 43-101. Project failure may materially adversely impact the Corporation's future profitability, its ability to repay existing loans, and its overall ability to continue as a going concern. CALGARY, ALBERTA - (July 09, 2018) - Antioquia Gold Inc. ("Antioquia Gold" or the "Corporation") (TSX VENTURE: AGD) (OTCQX: AGDXF) is pleased to provide an update of construction and development at the fully funded Cisneros Gold Project in Antioquia, Colombia. Mine preparation and development activities continue moving forward at a rapid pace. At Guayabito mine, 2,500 meters of development have been completed to date, focused on level 1460 and including 750 meters of drifting along mineralized structures. The Guaico Mine is ready for the start of operations and 6,385 meters of mine infrastructure have been completed. The Guayabito mine, located 500 meters away from the production facility, has produced 1,637 tonnes of mineralized material that has been stockpiled for mill feed. The Guaico mine is located 7.0 km away from the production facility and has a stockpile of 6,565 tonnes of mineralized material. All roads from the mines to the production facility are complete. Concrete foundations and piloting platform were delayed by challenging weather and are now 90% complete. Construction of the grinding area, fine ore chute and filtering areas have been completed and assembly of the fine ore tank, mill and filtering building is underway. The engineering sign off of the first stage of the tailings dam structure is complete and the excavation and construction of the diversion and control channels for surface water continues. Construction has started at the industrial wastewater treatment plant located at the tailings dam. A tailings pipeline will be used to efficiently move the tailings slurry and construction is proceeding according to schedule. The construction of the first 6 overpasses and the burial of pipes is underway. Hydraulic pressure tests are being carried out on the pipeline. Construction and installation of the electrical facilities is ongoing, and construction of the main electrical substation is complete. Power connection to the facility is complete and 80% of the internal electrical connection line is complete with work ongoing at the electric rooms. All long lead equipment including ore sorting equipment is on site in preparation for installation. The Company is in the process of applying to the Colombia environmental and mining authorities for a permit to leach its gold concentrates. The company carried out an industrial-scale metallurgical test at the Quintana SAS plantusing a representative sample of 100 tonnes of mineralized material from the Guaico and Guayabito mines. Recovery of gold by gravity and flotation concentration was 98%, while recoveries obtained by leaching were above 90%. The Company continues to move forward on time and on budget towards production and anticipates the start of operations at Cisneros in the fourth quarter of 2018. Forward-looking statements relate to future events or future performance and reflect current expectations or beliefs regarding future events and include, but are not limited to any statements that express or involve discussions with respect to predictions, expectations, beliefs, plans, projections, objectives, assumptions or future events or performance (often, but not always, using words or phrases such as "expects", "anticipates", "plans", "projects", "estimates", "assumes", "intends", "strategy", "goals", "objectives", "schedule" or variations thereof or stating that certain actions, events or results "may", "could", "would", "might" or "will" be taken, occur or be achieved, or the negative of any of these terms and similar expressions) are not statements of historical fact and may be forward-looking statements. Copyright © 2019 by Antioquia Gold Inc. All rights reserved worldwide. This page was created on Mon Apr 22, 2019 at 10:19:36 AM Pacific Time.